In October the Gallery published American Glass: The Collections at Yale, the latest addition to an array of catalogues documenting its extensive holdings of American decorative arts. Written by John Stuart Gordon, the Benjamin Attmore Hewitt Associate Curator of American Decorative Arts, American Glass reaches beyond the Gallery’s storerooms to incorporate glass found across Yale University, including glass-plate photographs from the Beinecke Rare Book and Manuscript Library, a glass eye from the Harvey Cushing/John Hay Whitney Medical Library, and a stained-glass window that is part of the architecture of Linsly-Chittenden Hall. At the core of the book is the collection of glass assembled by lawyer and businessman Francis P. Garvan, which he donated to Yale in honor of his wife, Mabel Brady Garvan. Garvan was advised by the pioneering glass scholar Rhea Mansfield Knittle, and the book’s opening essay draws upon unpublished correspondence to reconstruct the close working relationship between the two, revealing how their shared belief in the importance of studying American material culture molded the collection. 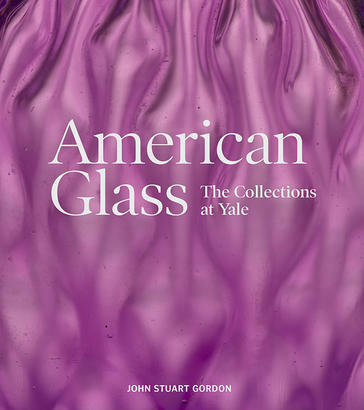 The entries in this lavishly illustrated volume span a remarkable amount of time, from prehistoric natural glass to contemporary sculpture, and range from luxurious housewares to scientific tools.With nearly two hundred lush images, American Glass: The Collections at Yale affirms that glass is indeed everywhere in American life.